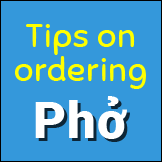 Hello and welcome to LovingPho.com! To help aspiring restaurateurs open and run their own pho restaurants, anywhere in the world. LovingPho.com is all about Vietnamese Pho and my passion for everything Pho, a simple yet complex, all-in-one, any-time-of-the-day fare of the Vietnamese street food. Pho came to North America since the mid to late 1975, brought over by Viet refugees. Initially most everyone landed in California as a final destination. Many went on to other North American destinations. Over the next 20 years or so, pockets of Viet communities flourished in major American and Canadian metro areas. Pho restaurants became the first of many businesses run by Vietnamese in these communities, provided a delicious taste and memory of the homeland. In the ensuing years, most customers to these restaurants were first and second generation Vietnamese, with a handful of curious Americans trying it out and loving it. By the mid to late 2000's with the wider use of the Internet, pho became one of the major food topics discussed online. Suddenly Vietnamese pho was becoming trendy and a popular foodie topic. The buzz on the Internet about pho in the mid 2000's was strong because it was a "new discovery" by many Americans looking for new tastes, and pho is easy to like and enjoy, and it is delicious. People were talking about it and sharing pictures of it pretty much like now, except that pho was still mostly unknown to the mainstream back then and was pretty much a novelty. Soon enough, it was taking on a life of its own on the Internet. People were, and still is in my opinion, taking a little too much liberty with what pho is and should be, and pho was definitely heading toward the fusion food route. I'm ok with fusion food if restaurateurs call it as such. But in many cases this was and still is not the case. Many concoctions were created and passed on as authentic pho by restaurateurs just to make money. I thought there was something wrong with that. I wanted to do something about it. By the late 2008, there was just too much inaccurate information about pho being shared (and spread) on the Internet. When a few other noodle creations were being passed off as Vietnamese Pho, I decided it was time to step up and tell the right story about pho, and at least to help those who cared to tell the difference. So in the midst of a handful of other excellent sources already online, LovingPho.com was born to provide readers with reliable information about what pho is and should be, and how it should be made, prepared and enjoyed. Once LovingPho.com got going, I began to also realize that there may be people out there who may be looking for help opening and operating pho restaurants. If I was going to help promote pho, I realized that I should be working on both sides of the table so to speak. On the one side there are the pho eaters who pay to enjoy pho and share their experience with others. On the other side are the pho operators who make and serve pho. I started writing articles about pho restaurant business based on my combined experience as a small business consultant, a pho restaurant operator, a marketer, an artist and an engineer. You can find a whole series about how to open and operate pho restaurants. For the business-minded individuals who want to fulfill their dreams of owning and operating your own pho restaurants, hit me up using the page How To Open Your Own Pho Restaurant Business. I'll walk you through the process from A to Z, or just on key topics that you may need help on. With LovingPho.com, I get serious in helping people understand pho, enjoy eating pho, and even open and run a pho restaurant. Beside the numerous articles on the business aspects of pho, I get nitty-gritty with pho on a very deep level. I discuss the variety of ways to enjoy pho, I answer questions on "Understanding the Pho Menu" (or what's with the many confusing pho choices on the menu?,) on how to pronounce pho, with some "Tips on Ordering Pho" and "How to Order Pho in Vietnamese," then maybe discuss a little bit of pho history and evolution while debunking some pho myths as well. 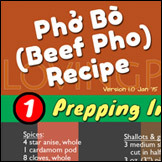 There are some top pho recipes to be shared too; particularly, I have created lovingpho.com's own beef pho recipe that you can find here. At times, I get very personal with this dish called pho; and sometime philosophical about it too. I hope you enjoy visiting Lovingpho.com. Your comments, suggestions and participation are most welcome. Articles, photos and other content contributions are gladly accepted. Sponsorships are most certainly appreciated. Please use the form on the Contact page as the first step to reach me. where to find a recipe for pho-tai nam gan sach soup ? Hi Ray Lang: You can use any beef pho recipe mentioned in the article Top Pho Bo and Pho Ga Recipes You Must Try Yourself for the pho you’re referring to. Tai is the sliced steak, nam is the flank, gan is the tendon, and sach is the tripe, all of which are prepared separately and served in the bowl when you’re ready to pour the hot broth in. Good luck. I stumbled onto your website after, and still trying to, do research on Pho as I am trying to incorporate this item onto m menu. I am Vietnamese and have an American/Italian Restaurant which serves Breakfast, Lunch and Dinner. I have had many requests from my loyal customers to add Pho. So far my research is going well with one exception – I cannot find a local supplier for the bones to make the stock. Help! I am in the Ventura County area. Hi Terrance: Would you add pho to your American/Italian restaurant menu? That would be an unconventional way or food combination wouldn’t it? Anyway, I’m not sure what you meant by local suppliers, but to me Ventura County is not far from Los Angeles/Orange County, so sourcing pho ingredients should not be a problem, unless you meant to want to stay strictly within a few mile radius. 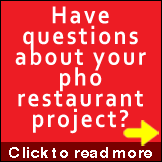 If you need more information, please use the pho restaurant consultation form to make an inquiry. I’ve been craving Pho lately and found your website this morning. Thank you so much for this wonderful resource. It’s clear your have put a lot of time and love into this enterprise. Keep it going! Thanks for stopping by Wendy. Hope you find the info useful. Now you should go satisfy that craving by ordering a large bowl of pho. Enjoy! I’m loving this as a resource so far! Well done! I’m looking into opening my own place and I’m so thankful for this site! @Susan: Thanks so much for your feedback. I’m glad you find the information here helpful. Don’t hesitate to reach out if you need further in-depth help. Cheers! I’m new to this forum. The reason I joined is that I’d like to ask for advice and feedback. Last week I attempted to make a traditional Pho for the first time. I recorded the entire process, so that you would be able to see what I did. I’d love to hear back from you, if you have any advice or if you can point out some of the mistakes I made to help me get better for the next time? @Kim: Nice effort. However, I’d consider your use of “traditional” in the title kind of a link bait (or at least misleading) because what you’re doing is not “traditional”. Not yet anyway. It may be your goal, but until you actually get there, it’s just another guy trying to make pho for the first time. – The amount of spices, charred onion and ginger used (hereby collectively called spices for convenience) for the amount of water shown is way overkill. These ingredients are meant to give a “hint” of their flavors to the broth, and not be overwhelming. From the look of the amount of water used (your yield), I’d estimate you only need 1/10 of the amount of spices shown. – Similarly, simmering the spices for 10 hours is way too long. In combination with using just a proper amount (mentioned above), the timing should just be long enough to achieve the flavor of pho. The actual length of time depends on what recipe you use (assuming it’s a good recipe), how much broth you’re making (desired yield), and proper scaling from said recipe to your yield quantity. – The factors above may explain why your broth is too dark. It is akin to making Chinese herbal medicine where dry plants and herbs (and even certain insects and animal parts) are brewed for a long long time to get the very dark resulting brew. – Both bones and meat should have been blanched and cooked together, then each be removed at individual time/stage. – Not sure what kind of pho noodle you used (there are many different kinds available on the market) but it looks like you just poured hot water over it and served. From the look of the noodle in your bowl, I’d say the noodle is undercooked. Properly cooked banh pho noodle should be a wet, soft, hot lump (but not overcooked), and not still have separated individual strands in loops as shown on the video. – Minor point: The broth should be steaming hot for serving. From the look of it, your broth seems lukewarm at best. However, because you’re also making a video which requires time for setup and such, it may not have been possible to have everything on cue. In summary, timing is very important in cooking, especially for good cooking. Lack of timing consideration may be what explains the dark broth (due to spices), the overcooked beef (meat falling apart), and the undercooked rice noodle. Thank you so much for this feedback. Your points are definitely helpful. I think I’ll try to make it again with those adjustments and also make sure to show how much I use of everything to give a clearer picture.